We are so fortunate to have built so much of our business off of referrals and word-of-mouth, and are extremely appreciative of anyone that passes along our name to someone considering building. Our latest project came to us via a family member of a recent client. So, as we wrapped one project with an awesome family, we got to pick up with their equally awesome relatives. The homes these two families have designed have very different aesthetics (the other was a classic farmhouse), but we love the shared passion and commitment to a vision that both of these clients have brought to the process - their energy for the custom build process is infectious. On this latest project we helped to find the family a great lot on Linscott Ave. From there, our clients sketched out ideas for the initial floorplan of their ideal home. Then, they found fresh inspiration to pass along to our architect, resulting in this transitional home reminiscent of a Tudor style home with a modern flair. ...their own rendered version of their home designed in Minecraft! Check out their version below. Aside from being pretty close to our official rendering, it's also just plain cool to see them pull this together. Any of our other clients interested in taking on the Minecraft challenge?! Seeley, Duane, Madison, Blodgett projects- we're looking at you! For our clients that aren't as proficient in Minecraft, no need to brush up on skills. We now deliver a rendering of each home's exterior as a part of our process. It's an added step, but we found it goes a long way at making homeowners feel confident in the big design decisions. But back to details of this home! Linscott Ave has a refined exterior composed of painted brick and Hardie plank lap siding. The addition of curved rooflines, doors and windows add great visual interest while the dramatic two story window floods this home's entry with natural light. Inside, rooms were carefully designed with the homeowner's practical use in mind; a desk nook tucked away, an oversized dining space in lieu of a more formal dining room, and a family room with french doors opening to the backyard. They've really designed their home for how they know they are most likely to use it. A detached, 2 car garage features a charming cupola and wood pergola with brackets, ensuring that even the garage will add character to the home. This home is located on Linscott Ave in northwest Downers Grove. We've built two other homes on Linscott Ave before and it's a crowd favorite. 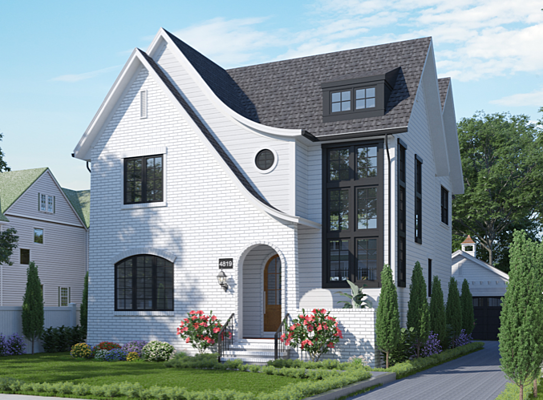 With brick-lined streets and proximity to so much in Downers Grove (Pierce Downer Elementary, Herrick Middle School, Downers Grove North High School, town and train), there's so much to love about this location. And we can't wait to see how nicely this this modern Tudor inspired home will complement this picturesque part of town. We have identified some other fantastic properties in this area of Downers Grove. If you're interested in learning about available lots to build your Oakley dream home, just give us a call or drop us a line.